Toronto – March 6, 2018 – International Women’s Day is an annual celebration of the achievements of women — and an opportunity to renew our commitment to challenge the systemic oppression that women and girls continue to face across our country and around the world. This oppression comes in many forms: sexual harassment, violence, job discrimination and pay inequity are some of them. A century ago, oppression also included denying the rights of women to vote. The worldwide suffragette movements which overturned this oppression are the roots of International Women’s Day. Since then, the campaign for women’s rights has advanced but there is still a long way to go. The oppression of gender-based violence and sexual harassment continues to remain a brutal reality for millions of women every day — at home, at work, and in the community. This International Women’s Day, let us stand together and say “No More” to the violence, bullying and sexual harassment faced by women and girls. 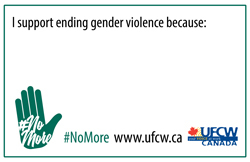 UFCW Canada encourages all activists to join this campaign by sharing your picture holding a card that declares your support to end gender violence. Post with the hashtag #NoMore on Twitter, Facebook and Instagram — and keep on posting until Equal Pay Day, April 9 and beyond. Activists are also encouraged to add your strength to the #NoMore campaign through participating in a short and anonymous survey. The anonymous results will be compiled and reported to politicians, employers and other stakeholders to boost their commitment to ending gender-based violence. 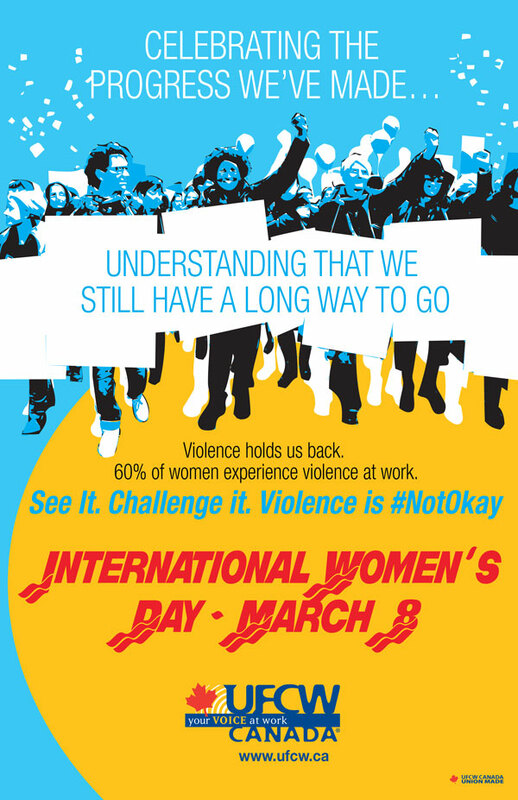 This March 8, International Women’s Day, as union activists and as neighbours, let us join together in voice and action to celebrate women and to work as allies to end gender-based oppression, violence and harassment on all fronts throughout the year.